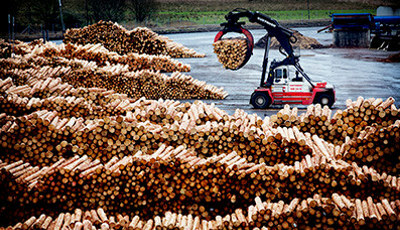 No construction material offers more environmental benefits than wood. 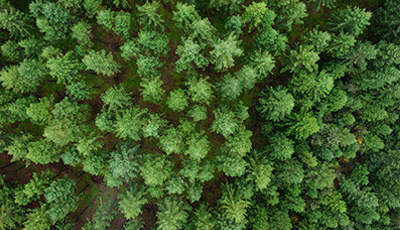 Here at Södra Wood, we talk about the three-fold benefits of the forest. It stems from the three ways in which trees reduce the amount of harmful carbon dioxide in the atmosphere. The first is that growing trees store carbon. The more growing trees, the greater the absorption. That’s why it’s important to have well-managed forests like ours that are carefully harvested and replanted. When various products are then made from wood that we harvest – like houses or commercial buildings, for example – harmful carbon dioxide is locked in instead of released into the air. The energy used to harvest, process and deliver timber on-site ready for use (called ‘embodied’ energy) is also extremely low, helping to reduce the typical 30-50% embodied carbon footprint of a building. A timber building structure also requires just a fifth of the vehicle deliveries demanded by concrete, for example. All this means reduced harmful emissions, pollutants and less consumption of finite resources like fossil fuels. Despite being remarkably strong and durable, timber is lightweight, versatile and easy to handle and install. On average, a timber frame reduces construction time by around a third and typically results in less-expensive building. 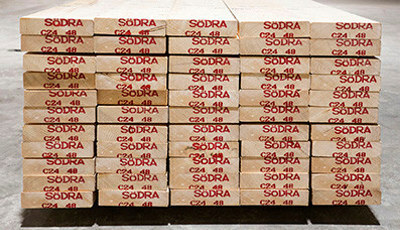 Södra Wood carries a wide range of PEFC-certified standard and system-based glulam sizes with just-in-time delivery. In additional to landed glulam stock sizes, other dimensions and grades are also available to order. Interested in designing with our timber?